Much of South Korea had some or all of last week off work, owing to the chuseokfall harvest festival. Westerners in Seoul take the opportunity to enjoy a quieter version of the city while Koreans take the opportunity (or if you prefer, adhere to the obligation) to spend the holiday in their family’s provincial hometown. Westerners married to or otherwise involved with such Koreans discover with a start that, contrary to expectations they may have had of a cultural experience rich with tradition, families here increasingly tend to spend chuseok on their sectional sofas, having an experience rich with television. 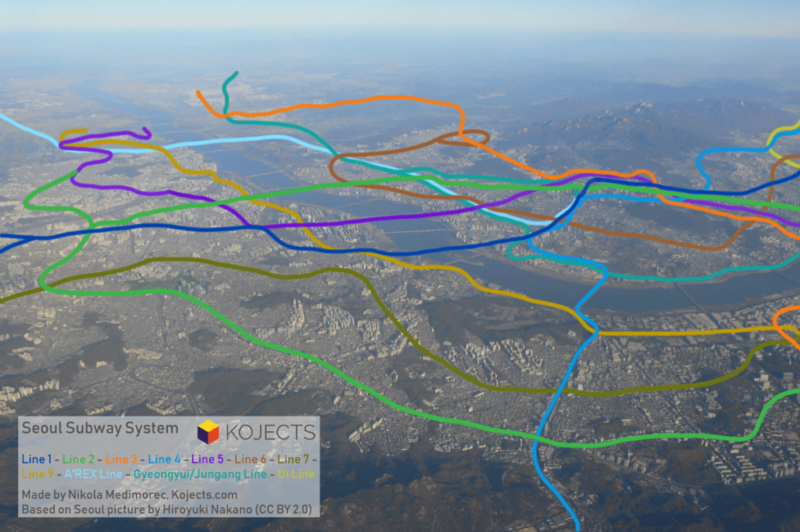 The networks, for their part, always make sure to keep the week’s programming interesting, and this year they found themselves blessed with additional abundance in the form of a political event to analyze, re-analyze, and then analyze the analyses of: the third inter-Korean summit in Pyongyang, capital of North Korea. 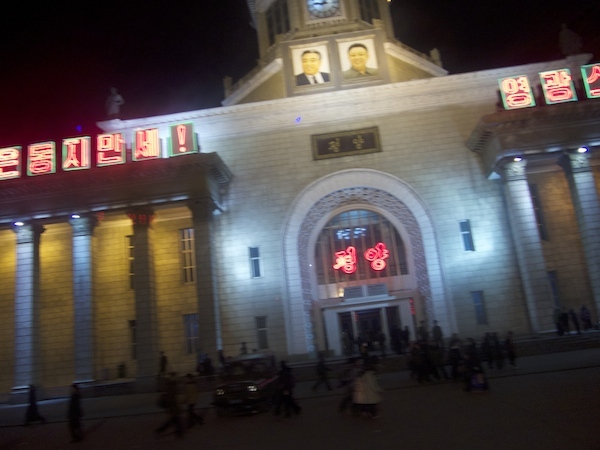 Not so long ago, relatively few knew what Pyongyang really looked like. At the peak of my own onetime fascination with North Korea, I had a hard time finding pictures of anything more interesting than looming concrete symbols like Monument to Party Founding and Juche Tower, the menacingly incomplete Ryugyong Hotel, and blue-uniformed traffic ladies standing sternly in the middle of otherwise deserted intersections. Now a single Google search turns up copious amounts of Pyongyang media, up to and including thorough visual documentation of its subway system, which those of us fascinated by North Korea used to half-suspect of being nothing more than a set piece orchestrated to impress visiting foreigners. Now even GQposts galleries of streets shots taken in Pyongyang — and, since everyone knows that the government deliberately uses the capital as a prosperous showpiece, other parts of the country as well. No opportunity to interview Ghomeshi, at least the Ghomeshi Q listeners knew, would ever present itself again. While in Toronto, I mentioned my attempt to a friend who has spent much of his life in close proximity to the Canadian entertainment industry. “Oh, Jian,” he said, shaking his head, his tone a mixture of disappointment and resignation. From his subsequent elaboration I gathered that Ghomeshi was well known for his boorish behavior, especially toward women, during both his career as a broadcaster and his time as a musician before that. Though I’d never heard any rumors to that effect before, it didn’t exactly surprise me: something about the apparent pains he took to be seen publicly projecting just the right sensitive, tolerant attitudes—his ‘virtue signaling,’ as such behavior was not yet widely labeled—struck me as unseemly, in the same way that the loudest and longest moralizing on the part of a certain kind of American politician always seems to precede the revelation of his utter depravity. Read the whole thing at Quillette. None has a culture more distinct than that of Busan, Korea’s second-largest metropolis. Located on the southeast coast, almost as far as a South Korean city can get from from Seoul and still be on the peninsula, Busan long served as the country’s main entrepôt, giving it a reputation as an international sort of place even in the centuries pre-modern Korea spent as a “hermit kingdom.” Historically, many of the arrivals into Busan came from nearby Japan (a distance one can now ferry across in three hours), and that cultural influence still manifests still manifests in the accents of the locals. I can attest to the conspicuousness of the effect Japanese sounds have on Korean speech; I happen to study Japanese as well as Korean, and speaking the former has had enough influence on the way I speak the latter that a Korean tells me I “talk like a Japanese person” at least once every few weeks. Each month I join Kurt Achin, host of Koreascape on Seoul’s English-language radio station TBS eFM, for an exploration of one of Seoul’s urban spaces. 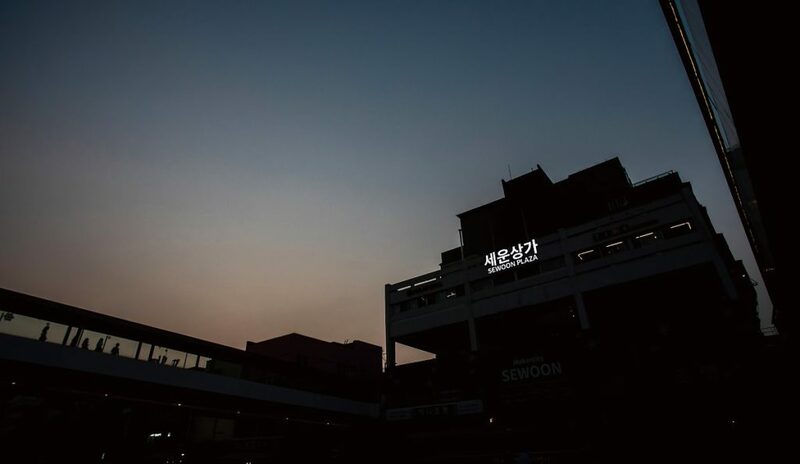 This month we explore Sewoon Sangga, the concrete megastructure that has survived half a century of change in Seoul and is now the subject of a revitalization effort like no other. Originally commissioned by Seoul mayor Kim Hyon-ok (nicknamed “The Bulldozer”) and designed by famed architect Kim Swoo-Geun (known for works like the Olympic Stadium, the SPACE Building, and the Freedom Hall), Sewoon Sangga opened in 1968 as Korea’s first large development mixing both commercial and residential space. Now, with the eight original buildings reduced to seven and much of the business for its electronics shops lost to other parts of the city — but plenty of activity still going on in its labyrinthine interior and on it wraparound public decks — the Dashi Seun (or “built again”) project is rethinking, remodeling, and augmenting Sewoon Sangga for the 21st century in an effort to bring together the expertise of the older generation already there with the enthusiasm of the younger generation of “makers” only just discovering the place. 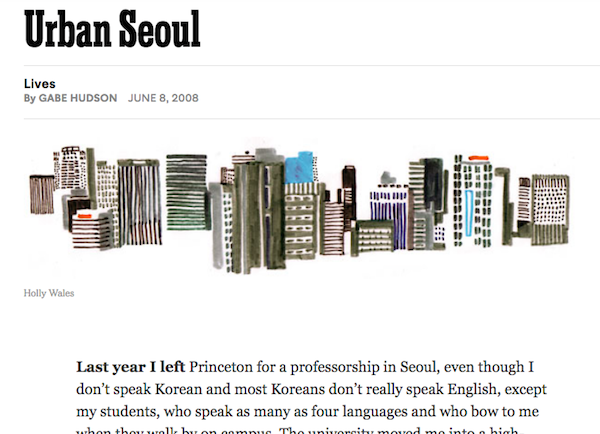 In the summer of 2008, the New York Times ran “Urban Seoul,” a piece of about 800 words on life as an American expatriate in Korea. Its author, a writer in his mid-30s named Gabe Hudson, had arrived here the previous year to take professorship at at Yonsei University, becoming the founding chair of the creative writing program at its Underwood International College. This reflection on “the ups and downs of newbie life in Seoul,” as the Korea Joongang Daily‘s Richard Scott-Ashe writes, “sparked some lively debate on local blogs, foreign and Korean alike.” That’s one way of putting it. A decade after its publication, the collective Seoul expat memory still regards Hudson’s short essay as the standard-bearer for bad Western writing on Korea, the worst first-person sketch of the country to appear in a major publication this century. One can criticize Hudson for writing about a foreign country from a place of ignorance, but he says as much himself up front. “I don’t speak Korean and most Koreans don’t really speak English,” he admits in the first sentence, “except my students, who speak as many as four languages and who bow to me when they walk by on campus.” A Korea-resident Westerner not speaking Korean is, as every new expat here discovers — some with a shock, some with relief — more or less par for the course. So is the expectation of English proficiency for students in Korea’s most prestigious universities, the top three of which, Seoul National University, Korea University, and Yonsei University, constitute the striven-for holy trinity of “SKY” schools. A video that recently hit the internet may well turn out to be the year’s most effective piece of Korea-promotion — if not the decade’s most effective — and Korea’s official promoters had nothing at all to do with it. Titled “seoul_wave,” the seven-minute production presents a day in the life of Korea’s capital as hyperkinetically shot and painstakingly edited by an American “nomadic filmmaker on an endless world tour” named Brandon Li. This might not sound like high-priority viewing for those who actually live in Seoul, and I might never have watched it myself had not seen it praised by other expatriates here. Not the easiest group to please, they keep their knives perpetually out for cynical or ignorant Korea-boosting — in other words, for much of the Korea-boosting done to date. 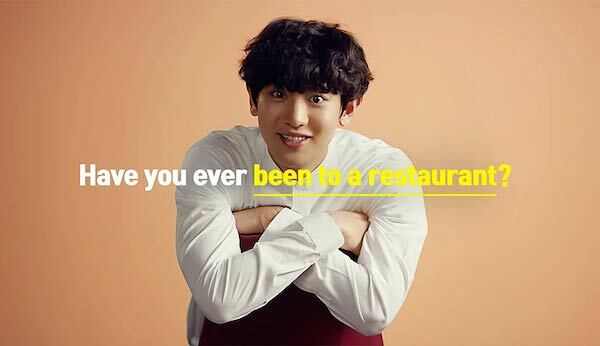 Take, for instance, the Korea Tourism Organization’s “Have You Ever… ?” campaign. In its teaser video, published the very same day as “seoul_wave,” members of the boy band EXO ask questions like “Have you ever slept?” and “Have you ever been to a restaurant?” To which a variety of non-Koreans, mostly Westerners, provide responses, to the best of their ability, like “I’ve never slept like that” and “Never been to a restaurant like that.” Presumably they mean they’ve never slept like they could in Korea and never been to a restaurant like the ones they could go to in Korea, but the generic, not especially Korean-looking backgrounds against which the speak only muddy the meaning further. But the awkwardness goes deeper stil: the EXO boys’ words have clearly been dubbed over, a risky choice given the obsessiveness and hypersensitivity of K-pop fan bases. 외국에 살든 아니든 간에 외국어를 공부하는 사람들은 똑같은 도전에 직면하게 된다. 그 도전은 외국어를 구사하고 싶으면 무엇보다도 방대한 양의 그 언어에 노출되고 또한 소화해야 한다. 옛날에는 언어 습득을 위해 충분한 양의 언어를 듣는 것은 힘들 수 있었지만 소위 뉴미디어가 풍부한 오늘날에는 많이 쉬운 일이 되었다. 한국어를 배우는 나만의 독특한 방식은 매일 한국어로 된 뉴미디어의 일종인 팟캐스트를 듣는 것이다. 여기서 말하는 팟캐스트란 한국어를 가르치는 팟캐스트를 뜻하는 것이 아니라 한국인 청취자를 위해 만든 것을 말한다. 팟캐스트로 다운받을 수 있는 내용은 많을 뿐만 아나라 놀라울 정도로 다양하다. 어떠한 관심이 있어도 그 관심과 맞는 팟캐스트가 존재할 가능성이 굉장히 높다. 나는 도시와 건축에 지대한 관심이 있어서 어딘가에 갈 때마다 적극적으로 그 곳의 건축전반에 관한 정보를 찾는다. 나는 외국어를 공부할 때 관심이 이미 있는 주제로 그 언어를 공부하라고 하는 흔히 들을 수 있는 충고에 따라서 건축과 관련된 한국 팟캐스트를 때때로 검색한다. 몇 달 전에 그러한 충고를 따라 검색해서 <건축탐구생활>이라는 유망해 보인 팟캐스트를 접하게 되었다. 팟캐스트는 언어를 배우는 방법의 한 가지로서 라디오보다 큰 장점이 있다. 그 장점은 팟캐스트를 진행하는 사람들이 전문적인 진행자가 아니라서 딱딱하지 않게 보통 사람처럼 말하기 때문이다. 그것 뿐만 아니라 전문가와는 달리 팟캐스트 진행자들은 생활에서 쓰는 필요한 속어를 잘 쓰기 때문이다. <건축탐구생활>의 진행자들은 다 한국 건축계에서 일을 하고 모든 에피소드에서 다른 주제를 가지고 건축에 대하여 토론한다. 첫 시즌의 에피소드들의 주제 중에는 술과 목욕탕과 크리스마스와 올림픽과 영화와 같은 다양한 테마가 있다. 어떤 에피소드들은 건축을 제주도나 일본이나 북한으로까지 펼쳐지기도 한다. 내가 팟캐스트를 라디오보다 좋아하는 또 다른 이유는 팟캐스트 방송이 라디오 방송보다 시간의 제약 없이 훨씬 더 길기 때문이다. <건축탐구생활>의 에피소드들은 보통 두 부분으로 나눠져 있고 한 부분이 거의 한 시간 반까지 지속될 수도 있다. 아이튠즈 후기들 중에 진행자의 대화가 산으로 가는 경향이 있다고 불평하는 것이 있기도 하지만 나는 바로 그 산만함을 즐긴다. 내 생각에 흥미로운 주제란 한 주제 뿐만 아니라 여러 다른 주제와 쉽게 연결될 수 있는 주제이여야만 한다. 이 팟캐스트가 보여주듯이 건축은 건축 뿐만 아니라 가구나 패션이나 음식이나 어린이 등 다양한 다른 것에 대하여 토론할 방식이기도 한다. 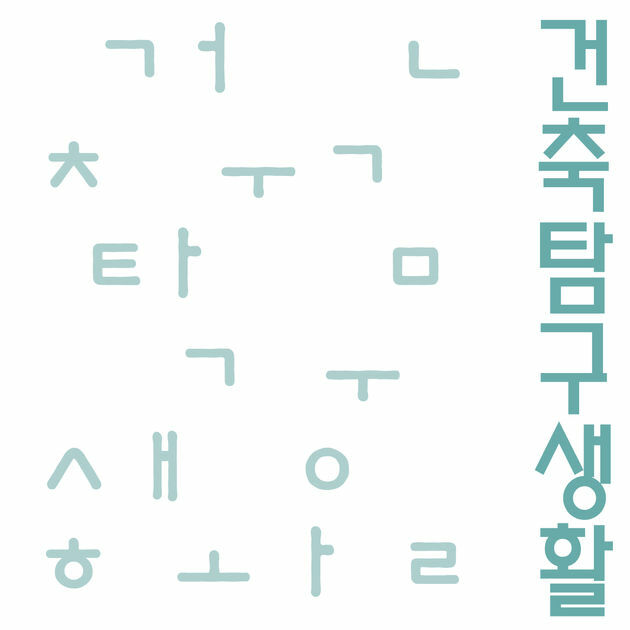 <건축탐구생활>은 작년 10월에 시작되었고 첫 시즌이 지난 6월에 끝났다. 이 팟캐스트와 관심이 맞는 나는 두 번째 시즌을 간절히 기다리고 있지만 진행자들이 청취자가 많이 없는 것에 대한 농담을 자주 해서 두 번째 시즌을 만들지 않을까 걱정된다. 그러나 최근에 한국에서 건축에 대한 풍부한 책과 잡지와 행사는 이러한 팟캐스트를 듣고 싶어 하는 사람들이 꽤 많다는 것을 시사한다. 나는 건축 팬으로서 뿐만 아니라 한국어를 배우는 사람으로서 쇼가 계속 되길 바란다. 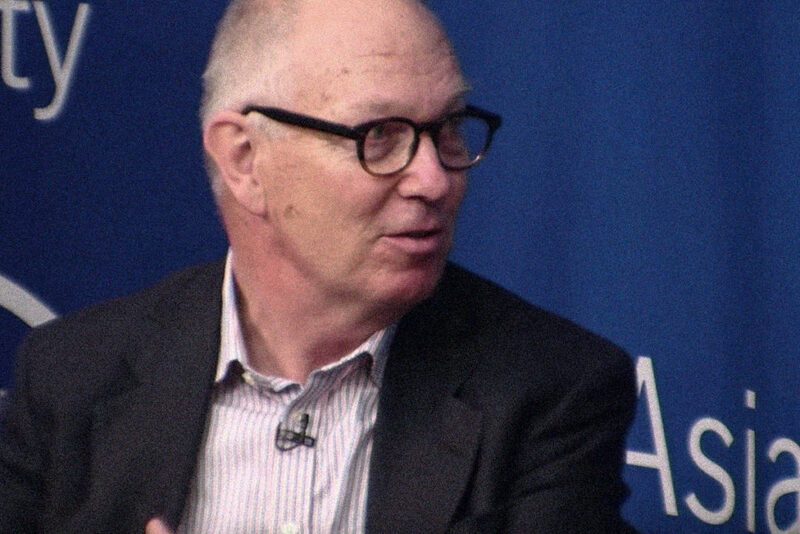 Last year, Ian Buruma succeeded Robert Silvers as Editor of the New York Review of Books. 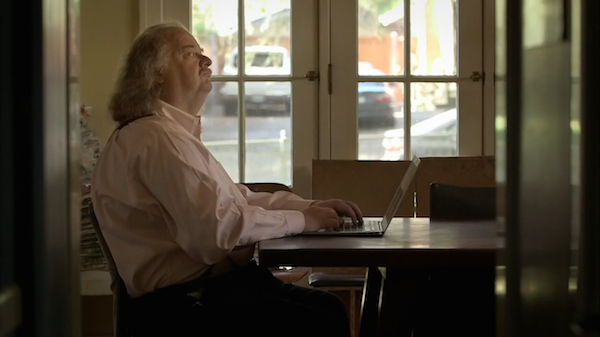 The long journey that brought him to that position began in his native Netherlands and passed, for six years from the mid-1970s to the early 1980s, through Japan. 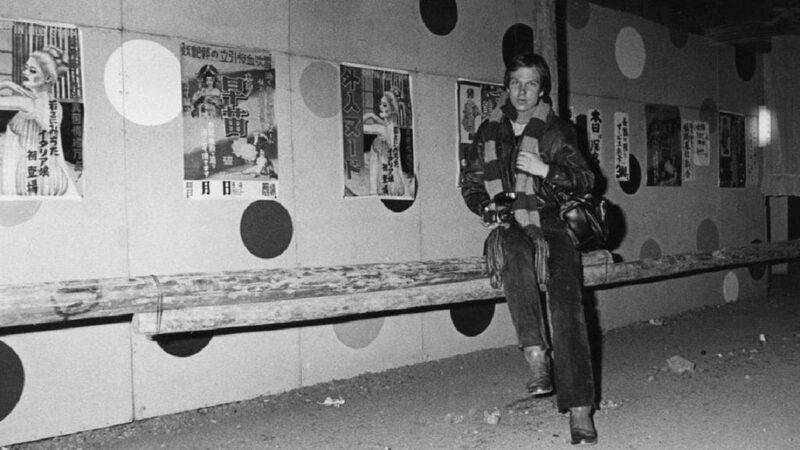 Though he went there in his early twenties, the period constituted something more than a youthful detour: “Japan was the making of me”, he declares towards the end of his new memoir A Tokyo Romance. He launched his writing career – which has widened in geographical and historical purview over the decades – by interpreting Japanese culture for a Western readership. Buruma’s contribution to the tradition of the Westerner-in-Japan memoir marks the first essential addition since John Nathan’s Living Carelessly in Tokyo and Elsewhere a decade ago. “Nathan lived in Tokyo in the glorious 1960s, where he had distinguished himself far more than I ever had”, writes Buruma. But despite considerable accomplishments – becoming Tokyo University’s first American student of Japanese literature, translating Yukio Mishima and Kenzaburò Òe – Nathan was always haunted by “the possibility that I possessed the wherewithal to distinguish myself only as an exotic foreigner in an insular island country”. The even-tempered Buruma has fewer bouts of self-doubt and despair to relate, but his experience in Japan has much in common with Nathan’s, including directing a trilogy of television documentaries about Japan for broadcast in his homeland. Nathan took as his subjects an urban family, a rural family, and the samurai film star Shintaro Katsu; Buruma chose the Japanese army, a Yamaha motorcycle factory worker, and a young woman’s intensive training to become a department-store “elevator girl”. At first, Buruma confesses, “I watched this spectacle with the sniggering attitude of a typical Westerner, reaching for the clichéd image of Japanese as human robots. But Hiroko was very far from being a robot. Hers was a performance, and she took pride in it”. Read the whole thing at the Times Literary Supplement.